Almost seven years ago, a trip to Portland, Oregon, for that city's jazz festival took me to Powell's, the incredible used bookstore. 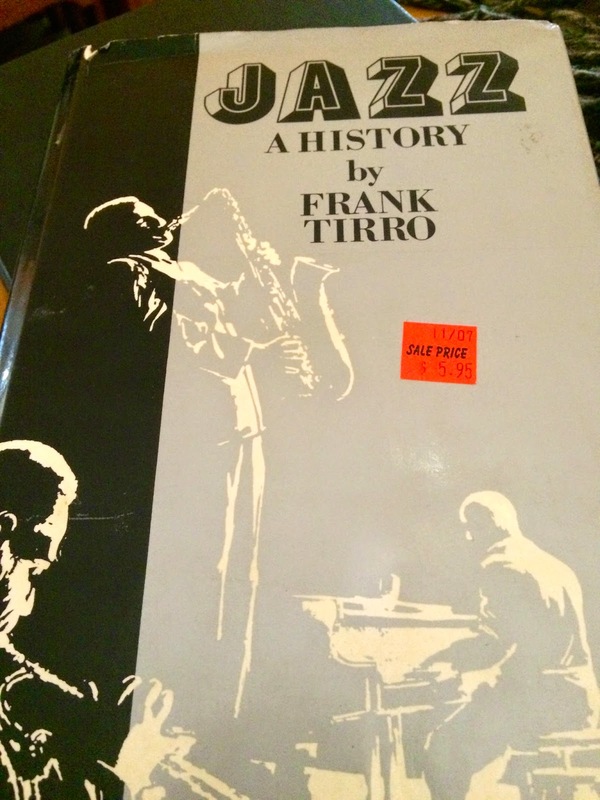 As I wrote here, the top find on that exploration was Jazz: A History, a 1977 book by Frank Tirro, who was then a professor at Duke University. I originally discovered Tirro's book when I was an undergraduate, studying American literature at Carleton University. I had followed an intensive course of study of literature since Grade 8, and almost a decade later I was, frankly, bored with the canon. My only thrill came from reading writers like William Faulkner, Robert Penn Warren and Ernest Hemingway, and there was only so much to read there. I started avoiding classes and hanging out in the university library, searching for a diversion. 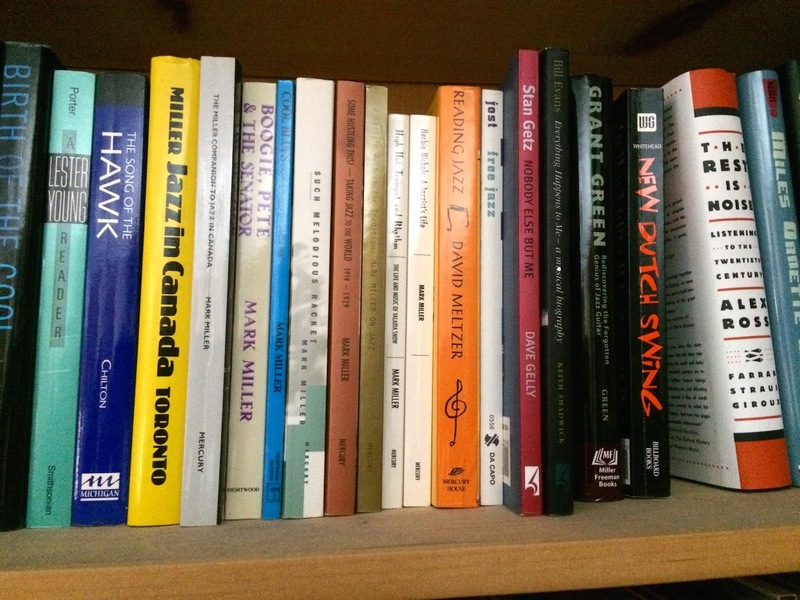 I found it in Tirro's concise writing on the music that I was beginning to discover through a nightly jazz program on CBC Radio and the handful of legitimate jazz recordings that my father had in his collection. There was something in his description of Ornette Coleman's seminal recording, Free Jazz, that grabbed me. This sentence, in particular, spoke to 23-year-old me: "What Coleman brought to jazz was new values, not the absence of values." I wanted to trace Tirro's logic back to the classical avant-garde, up through jazz musicians like Lennie Tristano and forward to the contemporary artists of the mid-'70s. I wanted it all; I longed to have all that music in my head, all that lineage under my fingertips. That's the power of good writing, and in reading Tirro I also learned a huge lesson about writing about music that I wasn't getting from Rolling Stone, where the majority of critics—with notable exceptions like Ralph J. Gleason, Greil Marcus and Jon Landau—relied on clichés and subjective rationale. Tirro also set the bar high for what I would look for in books about jazz and other types of art. Following that model, I quickly picked up on Ira Gitler's Jazz Masters of the Forties and Martin Williams' Jazz Masters in Transition. I discovered Gary Giddins' "Weather Bird" column in the Village Voice and Rafi Zabor's writing in Musician. I also discovered that talking books and authors with musicians and others in the business was even more interesting than discussing recordings, because books tended to be a more immersive experience. These discussions led me to exceptional works like John Litweiler's The Freedom Principle and Pete Guralnick's Lost Highway. One such discussion with writer Stanley Crouch in the back of a taxi turned me on to John Chilton's The Song of the Hawk, which, at the time, Crouch considered to be the most thorough jazz biography on the market. The early days of the internet also brought me into contact with writers themselves—people like Len Lyons and Eric Nisenson, who became an important champion for my own writing and a good friend until his death in 2003. People I know often ask me why I don't write my own book. At one point, Nisenson was encouraging me to put together something on a handful of Canadian artists—Paul Bley, Kenny Wheeler, Sonny Greenwich and Gil Evans—and how they reflected what Glenn Gould once called "the feeling of North." Based on my research on Greenwich, I also developed a more extensive plan for a book-length study of jazz guitar and how it evolved from a rhythm instrument into the premier solo voice in the genre. As a working writer (i.e., someone who relies on putting words on paper—or zeroes and ones on some server—to make a living) I find the prospect daunting. I've had no problem attracting offers to write books on subjects as diverse as egg marketing and war veterans' rights, but so far no one is knocking on my door to offer me a living wage to write about jazz. That gives me even greater respect for people like Crouch, Giddins and my friend Mark Miller, who continue to pour their energy and intellect into writing about the music they love. 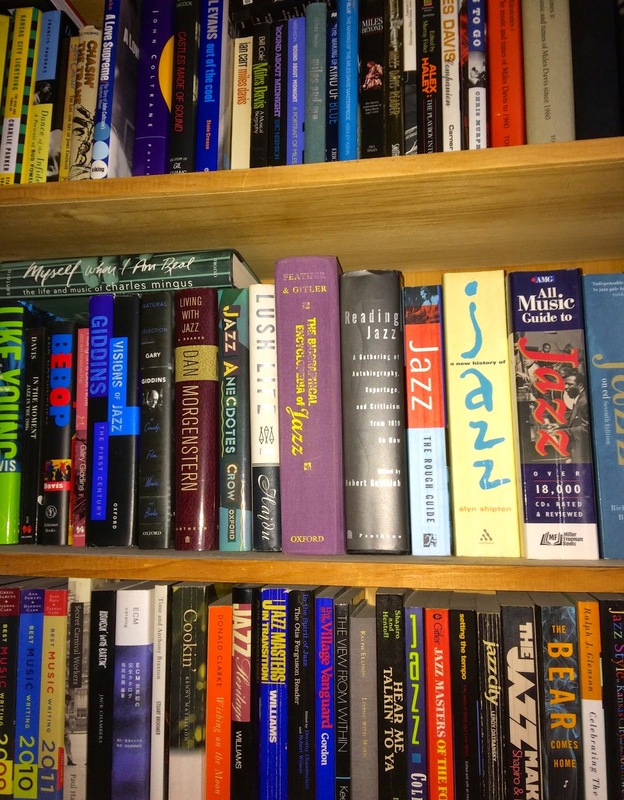 Books like Crouch's Kansas City Lightning, Giddins' Jazz and Miller's High Hat, Trumpet and Rhythm add to our knowledge of jazz, and, one assumes, continue to inspire bored undergrads somewhere. Addendum: Since writing this, I connected through LinkedIn with Frank Tirro. So happy to hear that he's still alive... and writing! He has a new book due for release in spring 2015. It has, of course, become a tiresome trope to say that jazz is dead or dying. The proof that nothing could be further from the truth—CD sales, tour support and club attendance be damned—is found over and over among the 341 recordings that have found their way to me so far this year. There was compelling listening to be found from newcomers, established players and veterans alike, and a handful of recordings that could stand with the best from any year in the past 20 or so that I've been assembling lists like this. I don't know why I should feel I need to preface my list with the following, but what the hell: My top pick this year is by a fellow Canadian. It's not there because he's Canadian; it's not even in the top 10 because it's by a Canadian. It's there because it is an exceptionally entertaining and well played recording that I hope a lot of people get to hear. I gave it 41/2 stars in DownBeat; it only missed getting the full 5 because it's only 47 minutes long, and I have a policy that to get the status of "classic" recording you have to give the consumer full value and be able to compete toe to toe with other recordings that are in the 60-75 minute range. Hey, I'm funny that way. So, with that stated, here is the top 10. My full list, which includes historical recordings of the year, best debut, best vocal and best Latin recording will be published on npr.org before the end of the year. In my DownBeat review, I wrote that: "With composition titles that allude to both Coleman Hawkins and Lester Young, saxophonist Michael Blake signals that he is reaching back six decades and more for inspiration on Tiddy Boom, while the presence of fellow modernists — and members of the Jazz Composers Collective — Frank Kimbrough and Ben Allison lets listeners know this will not be a mere nostalgia trip. Instead, it is more like a quick spin on a fun house ride, with Blake’s tenor burbling and barking out references to past masters while remaining firmly planted in the present." Again, from my DownBeat review: "On his second recording since moving to the United States in 2009, pianist Alfredo Rodriguez dips his hands into as much (of Cuba's rich and varied musical culture) as he can—the French and Haitian influence of Santiago de Cuba, the folkloric styles of the countryside and the relentless polyrhythms of Afro-Cuban music—and creates a highly personal pastiche." Smart, thoroughly contemporary jazz by everyone's favourite saxophone sideman. Mark Turner does not often front his own bands (this is his first album as sole leader since 2001) but he constantly displays his intelligence and taste when he does, and his bandmates—trumpeter Avishai Cohen, bassist Joe Martin and drummer Marcus Gilmore—are among the best young players on the scene. The young trumpeter's third album finds him continuing to develop a highly distinctive voice and making socially relevant music. On his ECM—and major label—debut, Vijay Iyer reaches back to his childhood love of the violin and chamber music and creates a stunning combination of string quartet, improvised piano and electronics. In essence, Iyer uses the string quartet as a laptop, pulling from it patterns and motifs that collide with and build on the other elements. Not since James Carter has a young saxophonist crashed onto the scene like Chilean newcomer Melissa Aldana, who won the 2013 Thelonious Monk International Jazz Competition. Her major label debut is as audacious and self-confident as you might expect. This was another recording that scored very high in my DownBeat review, where I noted the "seemingly effortless chemistry among (Etkin, Curtis Fowlkes, Lionel Loueke, Ben Allison and Nasheet Waits) and their relationship to compositions that span several continents without making much fuss about creating truly global music." At its essence, jazz is about interaction and improvised dialogue, and I never tire of hearing trumpeter Dave Douglas and his longtime collaborator, pianist Uri Caine, exchange ideas. 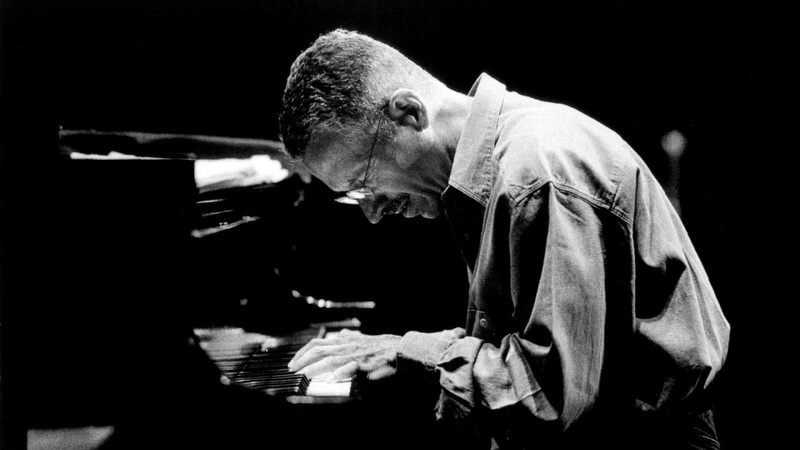 Speaking of which, Keith Jarrett and Charlie Haden shared a special chemistry that spanned several decades, and this beautiful final meeting is almost too heartbreaking to endure. RIP Mr. Haden. A second Canadian (and Quebec native) on my top 10—pianist Marianne Trudel deserves to be much more widely known for her gorgeous compositions. In fellow Canadian Ingrid Jensen, Trudel has found the ideal voice for her spirited and uplifting music. This is one of Jensen's best recent performances, which is saying a lot given how great she always sounds. 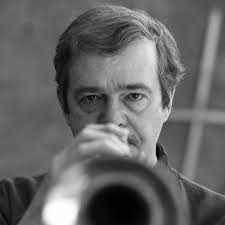 First, an embarrassing admission: I didn't know trumpeter/composer Kenny Wheeler was a fellow Canadian until about 1979. In my naiveté, it never entered my mind that one of my countrymen would be leading quietly spectacular albums like Gnu High on ECM Records with sidemen like Keith Jarrett, Dave Holland, and Jack DeJohnette. In my defence, Wheeler had left his native Canada before I was born, fleeing the possibility that he would end up teaching high school. While Wheeler had the self-effacing, shy manner of a math or science teacher, he had a restless spirit and a desire to put himself in challenging situations that he never could really explain. Why else would a quiet man find himself mixing it up on London's burgeoning jazz scene in the 1960s with woolly, fearless improvisers like saxophonist Evan Parker and drummer John Stevens? When I first interviewed Wheeler in 1997 (for my first feature article for DownBeat) he addressed my curiosity about what drew him to that situation. "I find playing free with people I like very therapeutic. I feel much better afterward (although) I would find it hard to say whether what we played was good or bad. I just knew that I'd gotten something out of my system." That quote captures Wheeler's personality, but it doesn't begin to tell you what Wheeler sounded like when he put his trumpet—or, increasingly in later years, flugelhorn—to his lips. It was an extraordinarily human tone, one that cracked with longing or sorrow, and a lyrical line that was full of sudden leaps and turns, intervals that broke your heart and shone a light on the proud, melancholy man who held the horn. Being Canadian, I had the opportunity many times over the years to see him play in person, and the great honour to talk with him on a number of those occasions. During our last conversation—in an alcove off the lobby of an Ottawa hotel—it was clear that his health was fragile; he was slow moving and stooped. As we parted, I mentioned to him a dream that my late friend, writer Eric Nisenson, and I used to pass back and forth: Wouldn't it be great to hear Wheeler play with Sonny Rollins? A few years after we dreamt up this ideal match, Eric found himself writing a book about Rollins. He asked the saxophonist if he knew Wheeler's music, and Rollins agreed that it would be an interesting combination. I mentioned this to Wheeler as we made our good-byes. He smiled one of his rare smiles, shook his head a bit, chuckled to himself, and said: "That would be something." Author A.A. Milne based his classic children's tale, Winnie-The-Pooh, on a Canadian brown bear that had journeyed to England with a World War I solder. Had Milne written his book a generation later—when trumpeter Kenny Wheeler, another transplanted Canadian, arrived in England in 1952—Wheeler could have been the inspiration for the charmingly gloomy character Eeyore. Like the pin-tailed storybook donkey, the 67-year-old Wheeler has a tendency to be hard on himself, expect the worst and be slightly suspicious when things turn out better than hoped. And who's to say he has the wrong outlook? Despite developing a distinctive trumpet voice on more than a dozen recordings of his own and about 60 others, festival promoters are reluctant to book him without all-star bandmates like Dave Holland or Jack DeJohnette. "I don't know why, but the (North American) festivals have never been interested in me," Wheeler says on a trans-Atlantic phone call. "I think some of them feel that I'm not far-out enough, and others feel I'm too far-out. It used to make me angry, but it doesn't bother me anymore. Still, I regret not being able to do what I want." What he'd like to do is tour more extensively with his quartet of pianist John Taylor, bassist Chris Lawrence and drummer Adam Nussbaum, or make an album with fellow Canadians Paul Bley and Sonny Greenwich, or write more big-band music. The latter is a pursuit he particularly misses. "I had a nice period around 1990 when I had quite a long British tour paid for by the British Arts Council. The album Music For Large & Small Ensembles came out of that. That was very successful, and I thought after that there would be quite a lot of call for what I do, but there wasn't any. Times change. I mean, I never was in fashion, but I'm certainly not now. I have the itch again to write some big-band music, even if nobody wants it. It'll always be there if somebody else wants it." Fellow trumpeter Dave Douglas, who recently worked with Wheeler in England, believes there should be no shortage of takers. "Kenny's compositions are jazz standards; I learned them at music school. When you're studying the music, Kenny Wheeler's tunes are one giant area where you need to focus. They're unique in jazz composing—the different ways of having the chords move, different types of chords, always really interesting phrase lengths; odd phrase lengths, but somehow with melodies that make them work." Saxophonist Rob Frayne, another musician in his 30s who has studied Wheeler's music and worked alongside him, adds: "He uses thick, heavily weighted chords, and shares the transparent voicing ability that Gil Evans had for thinning out a thick chord. It's almost romantic music in that there are these beautiful melodies, but there's always a bit of variation, and they always tell a story." Characteristically, Wheeler modestly dodges the compliments. "If anything, my composing has gotten simpler. To me, it sounds quite simple and melodic." He doesn't mind the romantic tag, though. "I try to write my idea of a nice, slightly melancholic melody. A lot of the old standards were very sad, but when I hear them now it makes me feel quite happy and good. You take sad sounds like Billie Holiday or Miles—they had kind of a melancholic way about them, but I loved it very much." Wheeler may be wary of life's disappointments, but he has never been afraid to follow his instincts. At 22, he suddenly changed his mind about becoming a high school teacher and booked passage on a ship bound for England. The vague idea—planted in his mind by a boyhood friend and future DownBeat editor, Gene Lees—that there were English bands needing trumpet players seemed more appealing than enrolment in Montreal's McGill University. What bands there were mostly ignored him, and he wound up finding work at the post office. After two years and marriage to an English woman, he began getting gigs with Tommy Whittle, Joe Temperley and, eventually, John Dankworth. The six-year relationship with Dankworth was a seminal one, with Wheeler using the alto player's band to develop his writing and arranging style. In 1968, Dankworth appeared, along with Dave Holland, John McLaughlin, Tony Coe and others on Windmill Tilter, which showcased Wheeler's compositions and helped to establish him as a highly individualistic writer. As a trumpeter, however, Wheeler was frustrated. The solo opportunities in Dankworth's band were slim, and there was a new air of improvisatory freedom blowing in from Europe. At London's Little Theatre Club, players like John Stevens and Evan Parker were experimenting with free music, and the open format gave Wheeler something intangible he was missing. "I find playing free with people I like very therapeutic. I feel much better afterward, (although) I would find it hard to say whether what we played was good or bad. I just knew that I'd gotten something out of my system." In addition to work with Stevens' Spontaneous Music Ensemble, Mike Gibbs' orchestra and drummer Tony Oxley's sextet, Wheeler formed his own band. "In 1969 and '70 my idea was to have a group of musicians I liked, no matter what area of jazz they came from. I had some straightahead players, some dixieland guys and a few free players all mixed up. I loved the sound of that band." The push and pull of free music and tightly structured compositions have marked his career ever since. He has balanced the abstractions of the Globe Unity Orchestra and Anthony Braxton with the cut-glass creations of Azimuth (which he co-leads with pianist John Taylor and vocalist Norma Winstone) and a wide variety of studio work. Still, it wasn't until the mid-'70s release of the star-packed Gnu High and Deer Wan on ECM that Wheeler's music became widely known in North America. Sidemen the caliber of Keith Jarrett, DeJohnette and Holland were the perfect vehicles for Wheeler's texturally rich writing, and producer Manfred Eicher's crystalline sound showcased his lyrical, wistful playing. Wheeler seems at home on the label, which has subsequently released six more recordings, including this year's gorgeously austere Angel Song with Lee Konitz, Bill Frisell and Holland. As proud as he is of Angel Song, Wheeler remains highly critical of his own playing. "I hardly ever listen to anything I've played. When I listen there's always something where I say, 'Why the hell did I play that phrase?' When you're improvising you don't have time to judge or fiddle about with what you're playing. It's not like composing, where you can take your time. If I could get into the same trancelike state that I get into when I'm writing, I could play a good solo. But I've never reached it." That kind of harsh self-criticism astounds devotees like Douglas, who recently invited Wheeler to play Booker Little's compositions with him. "I think he's absolutely an original stylist on the trumpet," says Douglas. "It's amazing to me that he's not more respected and known." Wheeler is not sure he wants that. "I don't try to be a mentor to younger players. I suppose I feel a little uncomfortable that young people are trying to play my music. I'm quite happy to be a little bit unknown. I wouldn't last very long with fame and riches." His discomfort with recognition has influenced his decision to remain in London. "I feel much more comfortable in a big city because I can walk for hours and no one notices me. If you walk along in the country, the farmer's dog comes out and barks at you, or people look up at the stranger passing by." Although he recognizes the advantages of basing a musical career in New York City, he isn't sorry he decided not to move there. "I've only played New York maybe 10 times, and I definitely have the feeling I'm in a foreign country." His diffident manner and soft voice, which has taken on a light English accent over the years, give Wheeler an aura of sad resignation, but he rejects the notion that he has regrets. "I feel as happy with my life as a person could be. I get to play good music a lot, and I'm doing what I like for a living." If you grew up listening to music in the 1960s, you believed in the magic that could come only from a recording studio. Despite the dominance of 45 rpm singles in the early years of the decade, it was the era of the studio album—40-45 minutes of music sequenced to create an immersive listening experience. Our heroes—Jimi Hendrix, Traffic, The Rolling Stones and The Beatles—worked with producers and engineers to produce sonic effects and blends of sounds that could not be replicated in concert. Guitar amplifiers and PA systems were not powerful, or subtle, enough to allow musicians—even those as skilled as Hendrix or Jeff Beck—to reproduce the kind of effects they could achieve in the studio, and 10,000 fans could easily overcome anemic sound systems if they decided to scream their support rather than sit back and listen. 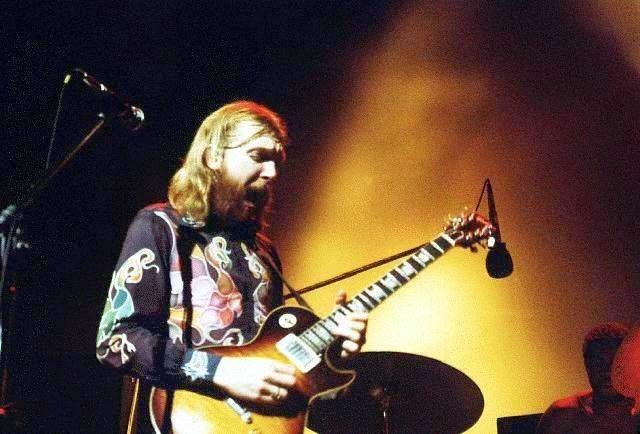 Duane Allman was no stranger to guitar distortion by the time he formed his ultimate band. Early photos show him playing a Fender Telecaster tricked out with an onboard Vox fuzz box, and a set of B.B. King-associated songs recorded by his band Hour Glass in April 1968 illustrate the gritty, fuzz-heavy tone he preferred, and could achieve, at the time. Shortly after, using a Fender Stratocaster and a Fender amplifier, he began putting his signature sound on recordings by Wilson Pickett, Aretha Franklin, Clarence Carter, and others. 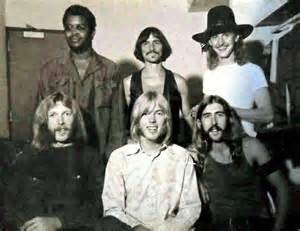 By the time The Allman Brothers Band coalesced, Duane was under contract to Phil Walden, the Macon, Georgia-based music entrepreneur who had backed the meteoric rise of singer Otis Redding. A few weeks later, when Gregg broke away from his recording contract with Liberty Records in Los Angeles and joined the band, Walden had begun bankrolling the as-yet-unnamed band, setting up an account for them with Lipham Music in Gainesville, Florida. Their first purchases were the kinds of instruments they hadn't been able to afford to that point. Duane switched guitar brands, getting himself a Gibson ES-345 with a fat sound, and then a gold 1957 Gibson Les Paul with PAF pickups, which he soon swapped into a 1959 Les Paul with a cherry sunburst finish. He and Betts began feeding their guitars through Marshalls, giving them a deep, powerful presence onstage. In early 1971, Duane landed the guitar of his dreams: an extraordinary 1958 Les Paul with a highly distinctive "tobacco" sunburst finish. Paired with a 50-watt Marshall and played primarily with bare fingers, the guitar gave him a full, round, lush sound with an unusual amount of edge. It was the ideal match for Betts' 1957 Les Paul—played through a 100-watt Marshall—and Oakley's highly resonant Fender Jazz Bass, which he had customized with Guild pickups and played through a Fender 400 PS amp. Although all of the band members were in their mid- or early 20s, they each had a wealth of onstage experience, and what had brought them together that spring in Jacksonville was an intense level of inner-band communication. Most ambitious musicians in those years brought a myriad of influences to any situation, but the members of this band were unusually broad in their listening experiences, and it was Duane's particular genius to understand how they all might fit together. He recruited Jai Johanny Johanson (Jaimoe) because of his experience with soul singers, his loose feel for rhythm and his love of post-bop jazz musicians like John Coltrane, Miles Davis and Roland Kirk. Instinctively, he knew Jaimoe would mesh in interesting ways with Butch Trucks, a well-schooled percussionist who (by his own admission, years later) was both withdrawn emotionally and unused to mixing with blacks like Jaimoe. Duane recognized that tension could be a positive thing if it was properly channeled. Dickey Betts grew up loving Southern fiddle music, but he also had developed a strong affinity for guitar-driven rock like The Yardbirds and Jefferson Airplane. He had a gift for creating distinctive, riff-based melodies, and a terrific ear for harmony. Berry Oakley had been a guitarist before he switched to bass, so he offered a strong third lead voice, but most importantly he was one of those rare musicians who played without ego; always looking for opportunities to add to a situation to make it better, and communicate to listeners. The missing piece was Duane's other musical half—the younger brother who could, by turns, infuriate him and enthral him. Where Duane was bold and driven, Gregg was wary and prone to taking the easy route, but he had the ability to open his throat and let out a voice that was as steeped in pain, loneliness and frustration as any of his blues-singing predecessors. And, together, Duane and Gregg Allman were stronger than they were apart; they drove each other with a power that only comes from years of sibling rivalry and love. And that's the mix that The Allman Brothers Band took on the road. They piled into the back of a Ford Econoline van, crammed head to foot across the width of the vehicle, and drove. They played as often as they could. When they didn't have a paying gig, Oakley would encourage them to set up in a park and play for free. By the time the band had graduated to a Winnebago motor home—a step up from the Econoline, but hardly luxurious—they were maintaining a ridiculous touring scheduling, criss-crossing the U.S. to stay in front of audiences, trying to build their reputation. While their first two albums—The Allman Brothers Band and Idlewild South—received only scant notice, their live shows won them fans wherever they set down. 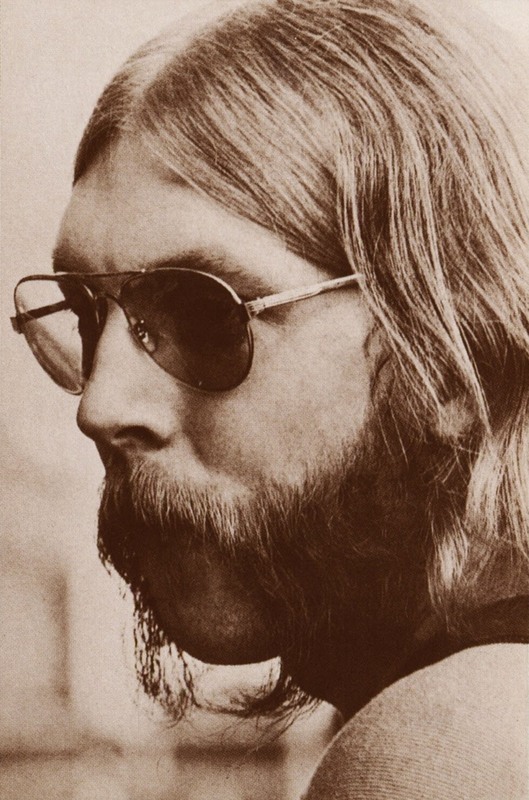 Duane Allman quickly recognized this, and as early as 1970 began telling whoever would listen that the band's third album would be two LPs recorded live. It was an unprecedented move; one that showed both his arrogance and his vision. Promoter Bill Graham's Fillmore East on New York City's Lower East Side had been one of the band's favourite places to play since they had first performed there—opening for Blood, Sweat & Tears—in December 1969. There was something in the work ethic and attitude of the young band that won the notoriously tough Graham over, and when Graham was in your corner, you would get opportunities to get noticed. He was enthusiastic about booking them both in New York and at the original Fillmore in San Francisco, and those venues provided bi-coastal stopping points for the band's tours throughout 1970 and early '71. When Duane Allman finally convinced Walden and Walden's Atlantic Records overseer, legendary R&B producer Jerry Wexler, to agree with his idea for a live album, the Fillmore East was an obvious choice. Wexler booked a mobile recording truck to capture the band's six sets on March 11-13, 1971. The resulting double album, At Fillmore East, has lodged itself at, or near, the top of many boomers' list of live recordings. Released quickly in July '71, it grabbed people's ears immediately—combining terse, tightly focused blues numbers like Blind Willie McTell's "Statesboro Blues" and Elmore James' "Done Somebody Wrong" with loping instrumental originals—"Hot 'Lanta" and "In Memory Of Elizabeth Reed"—and two epic improvisatory pieces, "Whipping Post" and "You Don't Love Me." The band's sound, captured by veteran, simpatico producer Tom Dowd, was exceptional—the sonic personalities of Duane and Betts contrasted extremely well, Oakley's bass clean and clear, the drummers well separated and distinct in the sound mix. In my group of friends, At Fillmore East rapidly became a staple at parties—something that experience has informed me was repeated around North America. I think there are several factors—aside from the music itself—that account for At Fillmore East finding its way to as many ears as it did in '71. First, was Jim Marshall's iconic black-and-white cover photograph of the band, and the decision to run the photo as a "full bleed" to take up the entire album cover. 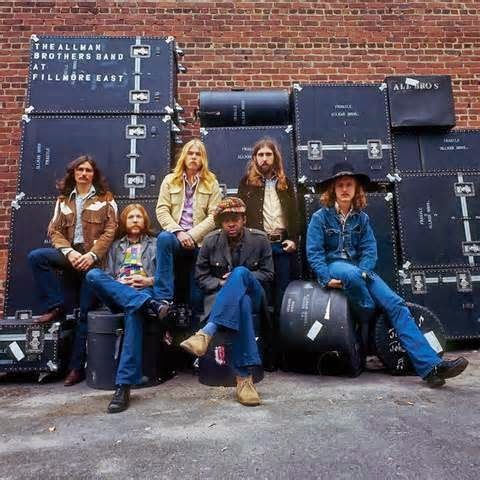 The photograph, with its brick wall and stacked road cases—which many incorrectly assumed was taken outside the Fillmore East—held some mystery and seemed to tell a story. Something is clearly going on: Gregg Allman has his head thrown back in laughter; Oakley is grinning and gesturing with his right hand; Betts has slouched to his left to look at Duane; and Duane is wearing a cheshire grin, his hands folded in his lap. "Did Duane just fart?" asked one my buddies, assuming the Allmans were a jovial bunch of frat-boyish jokers. The truth is darker and more complex: It was a grey, cold morning in Macon when Marshall got the Allmans' road crew, which is pictured on the back of the album, to stack the band's gear in a downtown alley. The band, which was never enthusiastic about posing for photographs, had been partying the previous night and arrived for the photo shoot surly and hungover. Alternative shots from the day show the band staring glumly at Marshall's lens. Everyone was growing tense. Suddenly, Duane spotted one of his drug connections across the street, and he infuriated Marshall by jumping up and trotting over to score. Just what he was scoring remains conjecture, but the sorry fact is that, by this point, Duane was in the grips of both heroin and cocaine addiction, and both he and some of his bandmates were beginning to realize the drug abuse was taking the brilliance away from his playing and from the band's communication. Regardless, the drug score lightened the mood, and when Duane popped back into his position atop an upturned bass drum box (and one can imagine him drawling to Marshall something like, "Okay, man, you can continue now.") the band broke up with laughter. A second factor in getting the album noticed was a deal between Atlantic Records and Rolling Stone magazine to make At Fillmore East a subscription bonus throughout the summer months. I got my first of many copies of the album—complete with the rare pink Capricorn Records label—by signing up for a magazine subscription. Third, is the phenomenon that occurs every time a notable musician dies. When the news broke that Duane Allman had died in a motorcycle accident in Macon on October 29, 1971, interest in At Fillmore East spiked. Sometimes, these posthumous sales spurts can be morbid curiosity, sometimes a tribute to the dead musician. In this case, I think it was more a realization that this band, which had reached its zenith with this live recording, would never be the same. The lightning had escaped the bottle. 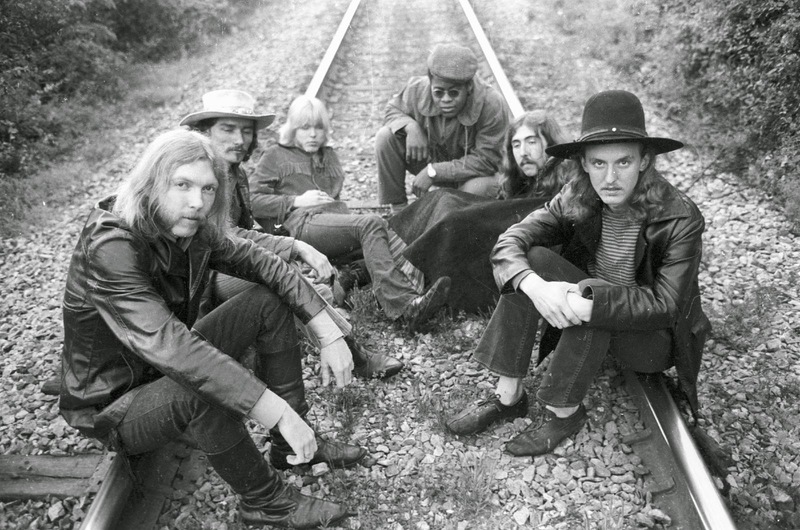 The Allman Brothers Band would go on to much bigger fame—becoming the most-popular band in the U.S. between 1973-76—but, deep down, those of us who knew the band's music understood that the peaks of At Fillmore East would not be reached again. So, the album has become a talisman, a lesson in the ephemeral nature of art, and an enduring artifact from a very engaging time in rock music. Rolling Stone placed it at #49 on its list of 500 best recordings. In 2004, the Library of Congress named At Fillmore East to its National Recording Registry of important recordings. But, everyone knew there was more; after all, the band had played three nights. Where was the rest of what Dowd recorded that week? With some bands, that question might not matter. Some artists hit the stage and churn out basically the same show every time. Even legendary live performers like Springsteen don't often stray far from the tried-and-true. But The Allman Brothers Band was closer to a jazz ensemble than a standard rock band. Every show was different, and the premature deaths of Duane Allman and Berry Oakley meant that there are only so many opportunities to hear them interact in well-recorded settings. Even now, though, a few of the goods from March are missing. Like many open-minded and eternally searching musicians, Duane Allman was not satisfied with the six-member Allman Brothers Band, as difficult as that is to fathom. Like Hendrix before him, he had visions of a large ensemble that could play the band's catalogue with greater texture and volume than the six-man band could muster. In a radio interview, he alluded to his desire to scoop an unnamed musician from another band. One suspects now that the musician in question was percussionist Bobby Caldwell, then a member of guitarist Johnny Winter's band. Whenever possible, Duane would invite his fishing buddy Thom Doucette to sit in on harmonica, and when Doucette—who preferred fishing to committing to a band full time and riding in a Winnebago—was not available Duane would sometimes switch to music journalist Tony Glover, who had played harp in an influential blues band in the mid-'60s. Duane heard horns, too, and for reasons that went to the grave with him, he decided to introduce them to fans on his band's third album. As Jaimoe told writer Alan Paul for his thorough oral history, One Way Out: An Inside History Of The Allman Brothers Band, the two horn players—Rudolph "Juicy" Carter and "Tic" from Charlotte, North Carolina—had played with him in Percy Sledge's band. In the spirit that pervaded the band's early days living in Jacksonville and Macon, and jamming for free in the parks, Duane would sometimes invite them to sit in unrehearsed. Former road manager Willie Perkins told Paul that Duane was also open to their presence because they supplied him with heroin. 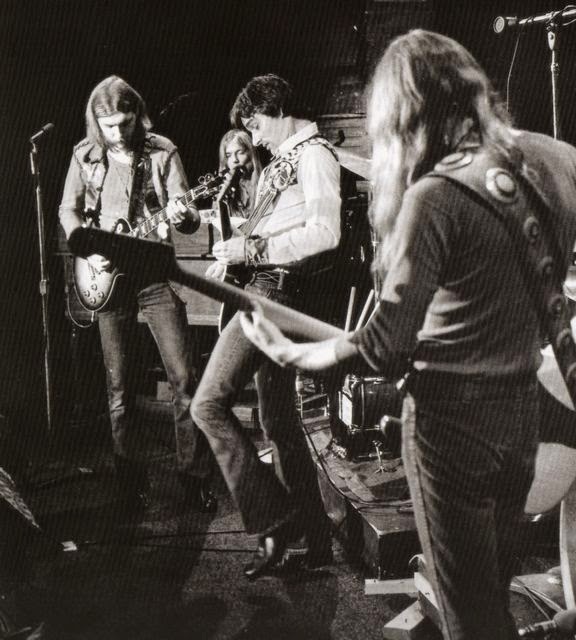 Whatever the arrangement, the horns were onstage on March 11, opening night of the three-date stand at the Fillmore. Dowd, who had flown in from Europe the previous day and had no idea the horns would be included, was livid. As the band came offstage, he demanded: What was Duane thinking? Perhaps he was thinking about nothing more than getting high and giving Jaimoe's friends a chance to fit themselves in, but Dowd was having none of it. He nixed the idea, and presumably, since not a note remains of the experiment, erased the tape from the opening night. Although Duane agreed with the producer about not making a horn section a permanent addition, he prevailed upon him to allow Carter to take another shot at a couple of songs the next night. So we jump in as the band opens up on March 12, with Duane telling the crowd that the band was recording a live album. Having heard a half-dozen or more recordings of the band prior to and after the March Fillmore dates, I know that dissecting various takes of the band's blues standards is kind of a mug's game. Each version has strengths and weaknesses, and while hearing four versions of "Statesboro Blues" or Muddy Waters' "Trouble No More" back to back might leave you with a preference for one or another, you might just as easily want to turn into producer Teo Macero and start producing a Frankenstein version of all four. Although my ears are attuned to the versions on At Fillmore East (probably the album that I've heard more than any other, with the possible exception of Hendrix's Electric Ladyland, Bob Dylan's Highway 61 Revisited or Miles Davis' Jack Johnson) I think Gregg's voice sounds better on the opening show; at least, his articulation is better. The real fun comes when the band begins to stretch out, and as I've done in published reviews of Coltrane's box sets of live recordings, I like to note the interesting points of different versions rather than go through a note-by-note dissection of the various versions. To my mind, the band members never topped the version of "You Don't Love Me" they performed at A&R Studios for radio broadcast in the days following saxophonist King Curtis' murder, but there is much to chew on with the two unheard versions included here (three were actually played, but At Fillmore East contained a version that Dowd had stitched together from the version from March 12th's late show and March 13th's early show. The reason for that piece of post-production surgery becomes evident early in the March 12th version, when Gregg blows his entry on organ. That is compounded by a somewhat muddled solo by Betts. The piece just isn't gelling. And then Duane steps in. What follows is one of the best exchanges to be heard between him and Betts. In his opening statement, Duane's sound is incredibly hot and burnished—his volume up so loud you can hear every movement his fingers make on the strings. Betts moves back in with tremendous urgency, and both drummers are kicking hard, propelling him forward, and his ability to create melodic runs on the fly is really showcased. If you ever wonder why Duane Allman wanted Betts in his band, this is the solo to listen to; he never sounded better. Naturally, that only prompted Duane to weigh back in with something even tastier: an incredibly raw-sounding romp that begins with train horn blasts and continues in and out of tempo until some Fillmore wag yells a perfectly timed comment for the ages—"Play all night!" Indeed. By contrast, the back end of "You Don't Love Me" from March 13, which Dowd discarded, sounds absolutely fine, just not transcendent. Betts does not lock in with the drummers as well, following a somewhat unfocused intro by Duane, and then Duane's main solo lacks the drama and timing of the previous night. What it does have is some astounding back-and-forth between the guitarists, which illustrates just how well they could feed each other ideas. Which brings us to "Whipping Post," one of the handful of songs that Gregg is credited with composing for the band's first recording. He has, and rightfully so, given credit to Oakley for taking the song to a different level, by giving it its near-demonic drive and somewhat off-kilter feel. To me, the song—and the way the band extrapolated from its core when they performed it live—has always epitomized them: Gregg's hard-done-by lyrics, the Southern gothic imagery of a public flogging, the manic charge of the tempo, the opening for guitar improvisation. It has it all, and it lives so fully in the March 13th show, by which time it was about 5 a.m., that you can barely imagine what two other versions might hold in store. The performance of it from the second set on March 12 is notable for some interesting volume dynamics Betts creates, sounding almost like an electric cello at one point, but those who love the released version will likely feel that Duane cues Gregg's closing vocals a bit too soon, robbing the ending of some of its power. The opening set's version on March 13 has a particularly strong opening section, with Duane playing with more ferocity than on the released version. Betts' solo is slower to take off, however, and there is less suspense to its construction, making the final release a bit less dramatic. Still, a fine version, and one that shows that the band had a variety of ways of getting to the same conclusion. In the end, given this much extraordinary, and highly varied material to work with, one gains a much better appreciation for how Dowd showcased the best of this band—both in the sound he captured from the stage of the Fillmore and in the decisions he made in post-production. The pacing and song choices on At Fillmore East helped make it the cherished recording it is, putting it on par with any studio recording of its era because of the same level of skill—both onstage and off—that was applied to it. Never one to resist the latest web trend, especially when the days are long and slow, I'll throw in my bids for the recordings that have caught my ear at the halfway mark of 2014. Can you read anything into my list—say, the fact that Sonny Rollins and John Coltrane are there? Probably not, and you shouldn't assume that anything else I may have heard in the first half of the year will not make it to my final list for 2014; that's not necessarily the way I either listen to, or 'hear', things. I usually check out earlier releases as time allows, and some things that strike me the first few times I hear them won't stay with me when I do my final review sometime in the fall. But that's the list for now. Whenever the topic of Keith Jarrett comes up between me and my wife—not an unusual occurrence, given how he is one of the few jazz artists we both love in equal measure—one of us will recall what we remember as one of the most sublime musical experiences we've shared. It happened at one of the two concerts by Jarrett's Standards Trio we caught together at the Festival International de Jazz de Montréal during the time when our older daughter lived in the city's Old Port, just a short, romantic walk from the festival's venues. Our collective faded memory has shrouded most details of the concert (Was it the time that Jarrett went off on a rant about the francophone media? or Was it the night that we convinced each other that the woman seated in the row in front of us bore a striking resemblance to a notorious serial killer?) but what we both recall with crystal recollection is the version of "You Belong To Me" the trio played. Did Jack DeJohnette and Gary Peacock even play on the tune? Who knows. All we recall is the extraordinary improvisation that Jarrett reeled out. I've always enjoyed the Patti Page version of the song, which has been covered by everyone from Dean Martin to Gene Vincent to The Misfits (one of our younger daughter's favourite punk bands), but Jarrett's interpretation took the song far beyond anything that had been recorded in the dozen popular versions. It was, perhaps—actually, memory says there is no perhaps about it—the most moving thing we've heard Jarrett play, and we have spent no small amount of time listening to him. And yet, a search of Jarrett's database shows that he has never released a version of the song. There are multiple interpretations of various pop standards from the same era, but no "You Belong To Me." Once, knowing that my friend Nobu Stowe—a Japanese pianist who plays in a style akin to Jarrett's—was interviewing Jarrett for a Japanese publication, I inveigled him to ask why he had never included a version of the song on one of the trio's many live recordings. According to Stowe, Jarrett recalled the Montreal performance and shrugged. So, without recorded evidence of the brilliance we recall, the performance—Jarrett's stunningly gorgeous inventions and extrapolations of the harmony and melody—haunts us, coming up repeatedly in our conversations. At this point, we are almost at the point where we don't want to hear it. It could never live up to our memories, and that is so much the essence of great improvisation. It lives in the moment, is enjoyed, forms memories without our even knowing it, and is gone. Keith: If, by some odd chance, you encounter this, release a version of "You Belong To Me" at your own risk. Our standards are high. Few artists who attract rabid fans have bifurcated careers that divide those followers like John Coltrane. Even his longtime employer, Miles Davis—who lost legions of fans when he adopted electric music in 1968—won people back late in his career. A Love Supreme is usually the dividing line for Coltrane listeners. Most who swear allegiance to the saxophonist can't abide the music he made after he replaced pianist McCoy Tyner with Alice Coltrane and Elvin Jones ceded the drum chair to Rashied Ali. The addition of saxophonist Pharoah Sanders—who, at 24, introduced a fury of multiphonic overblowing to the ensemble—sealed the deal. 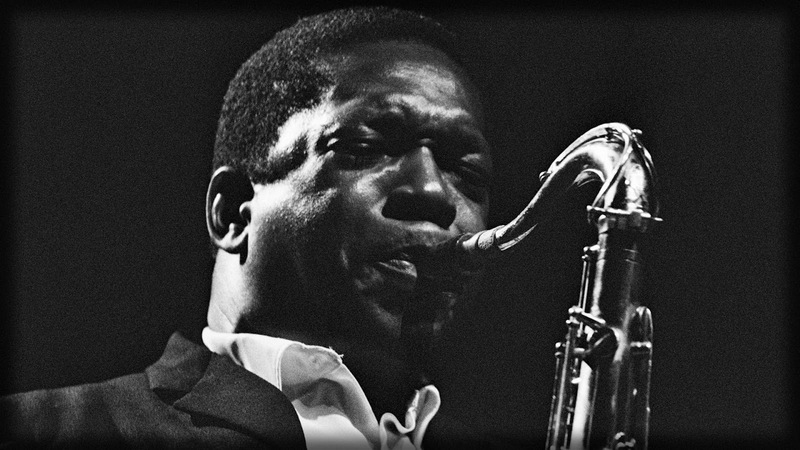 Listeners who were willing to follow Coltrane's explorations on "My Favorite Things" and "Afro-Blue" were not prepared to open their ears for the full-blown sonic onslaught of Live In Seattle or Ascension. But, for those whose love for Coltrane is unconditional—and I count myself among them, having devoured Live In Seattle with the same gusto as Giant Steps when I was about 18—it is time to rejoice. This year brings a much-discussed 1966 concert to commercial release. A joint project of Universal Music, which now controls the Impulse! imprint, and Resonance Records, Offering: Live At Temple University is 90-plus minutes of Coltrane at his most ecstatic, just eight months before he succumbed to liver cancer. Recorded on November 11, 1966, before about 700 people, the concert features the core of Coltrane's quintet (with Sonny Johnson subbing for Garrison) along with a quartet of Philadelphia percussionists and guest appearances by two local saxophonists. I have the pleasure of delving into the release from a number of angles for a forthcoming DownBeat magazine feature, which is providing the opportunity to think deeply about Coltrane's musical journey and trade thoughts with some others who have committed significant time to this kind of exploration, including writer/historian Ashley Kahn (who wrote the liner notes for the set), baritone saxophonist and jazz educator David Mott, young saxophonist Jon Irabagon, and others. This week holds promise of the opportunity to discuss the performance with Sanders, the sole remaining principal. "Coltrane's saxophone sounds like it is about to explode; it's under so much pressure," said Mott, who is no slouch at pumping tremendous volume through his own horn. "I hear tremendous urgency in his playing," said Kahn, whose books on the recording of A Love Supreme and on the history of Impulse! have provided him with unmatched access to the Coltrane oeuvre. Seldom have musicians approached music making with as much energy and single-mindedness as Coltrane at this late point in his short life. Although there is a definite 'shape' to the concert (he bookends the performance with "Naima" and "My Favorite Things," two of his best-known vehicles) there is no doubt that it defines what we think about the musician who poured everything he had into every solo and didn't stop playing until he had exhausted the possibilities of expression. Much is made of Coltrane's vocalizing at this performance, which includes some radical effects created by pounding on his own chest, but that is in keeping with the arc of expression introduced in the first movement of A Love Supreme and the Seattle concert with Sanders. The point to be made from this departure from the saxophone as a means of expression is that this is a man who was fully engaged in the act of communication. For those whose love of Coltrane extends only as far as 1965, who sometimes find the later works 'unmusical': They may have a point. This is expression beyond music, beyond what anyone had previously done. It's impossible, of course, to know if Coltrane was aware that death was close at hand, or to know where his muse would've taken him following these final concerts and the few studio sessions held in early '67 had he survived. It is possible, hearing the level of ecstatic release at this Temple University concert to believe that this is a level of ecstatic release and musical/spiritual connection that could never again be attained.